Highly illustrated letters adorned manuscripts in Old Ireland, Wales, and Scotland at the time of the early Celtic Church. The Book of Kells is probably the most well known illumined manuscript that’s come to us today. At the start of each chapter, the first letter of the first word is highly illustrated and highlighted with gold leaf. Just looking at the page, heightens the imagination. 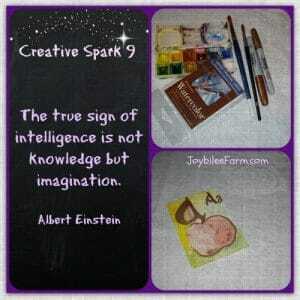 In today’s Creative Spark — number 9 in our series of 30 — create an illumined letter on your small canvas. 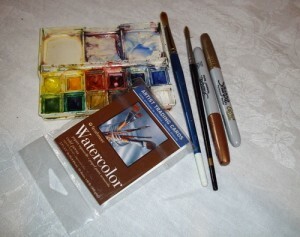 I am using an Artist Trading Card because it is the perfect size to create a simple work in just 15 minutes. You can use any piece of paper or even a journal page, that works with the medium that you choose. You don’t have to copy my technique or my medium. Use whatever pleases you and what you have on hand. This is your creative oasis, a place of refuge and shalom for you in the busy-ness of your life. Pick a letter. Hint: It doesn’t have to be a letter from the English Alphabet. Illustrate it as seems right to you. There is no right or wrong to this. 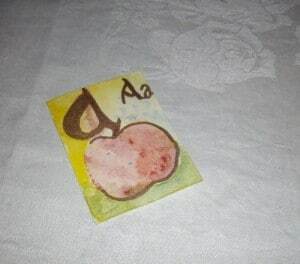 Once you are done, take a gold metallic marker or paint and highlight portions of your picture in gold. Draw your gold frame around your finished piece. If this is your first time here, find out more about the 30 days of Creative Sparks to build your creative thinking skills. Good to have you here.